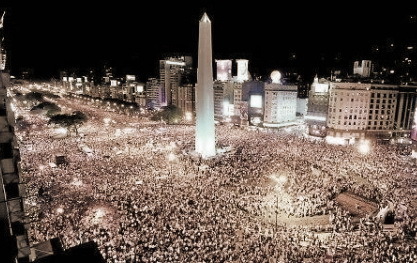 Authentic democracy filled the streets of major cities all over Argentina on the evening of Thursday, April 18, while tyranny stalked the halls of the national Executive, Legislative and Judicial powers. The A18 protest was, like its 8N predecessor, a spontaneous civic demonstration organized from computer to computer through the social media and without partisan links. A number of opposition politicians respectfully joined the protesters but from the uncomfortable low-profile position of tolerated guests rather than organizers, since demonstrators have made it abundantly clear ever since the first of three progressively stronger protests less than a year ago that they are as disappointed with the lukewarm opposition as they are furious with the rabidly self-absorbed ruling political movement. 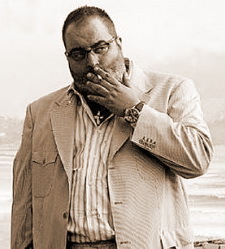 broadcast journalist Jorge Lanata proved a major catalyst for the 18A protests and clearly marked a “before and after” in terms of any doubts anyone might have had about links between blatant criminal activities and the powers that be. If opposition politicians were relegated to a secondary role in the A18 event, however, they were indeed showing greater activism than usual with regard to the “reforms” that a now embattled administration was seeking to ram through its rubber-stamp majority in Congress with the pace and power of an express train. 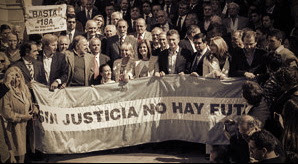 Two days before the mass protest, members of opposition political movements gathered before court buildings in Buenos Aires to protest the government-sponsored judicial “reform” bills, by holding up a sky-blue and white national banner bearing the inscription “Sin justicia, no hay futuro” (without justice, there is no future)—a noble thought and slogan, but not strictly true. Without Justice there could indeed be a future for a despotic government bent on ruling in perpetuity and on protecting its circle of influences—just not for democracy, representative governance or civil rights. 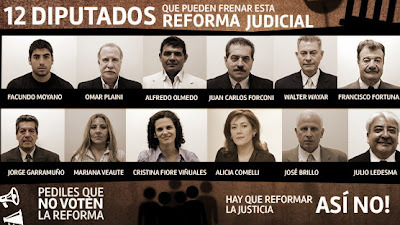 The protesting politicians also certified their opposition by signing a document rejecting what they unequivocally termed as the government’s “attempt to control Justice.” Among the opposition politicians involved in the pre-A18 protests were representatives of the centrist Radical Party and Peronist Opposition Front, the center-left Civic Coalition and the conservative PRO movement. Joining them were also numerous attorneys, former prosecutors, constitutional law experts and other jurists. The President, for her part, remained true to form and acted as if she had never heard the revelations of crime and corruption within her inner circle that Lanata reported in chilling detail and with documented evidence to back up his claims. 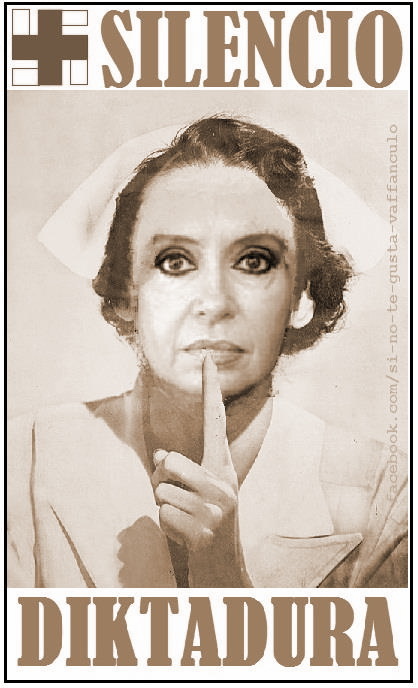 The task of defending her ivory tower walls she left to her surrogates in the press, like Mauro Viale and a once serious investigative reporter, Rodolfo Graña, who, of late, has become an unabashed cheerleader for the K regime and a pitbull sent to attack its enemies. In all cases, pro-K mouthpieces limited themselves to hammering the messenger rather than presenting any sound evidence to refute the Lanata team’s impeccable two-year investigation. One usual spokesman for the Kirchners, however, did break ranks when it came to the Judicial "reform" bills. 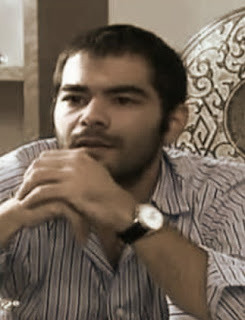 As head of the Center for Legal Studies (CELS), writer and former Montonero urban guerrilla Horacio Verbitzky, who not only usually follows the government's script but also often writes it, surprised many observers by sharply criticizing the bills for restricting the civil rights and legal recourse of citizens. Meanwhile, the public got a taste of what the proposed government-sponsored “reforms” will mean to Argentine civil rights when the corroded wheels of justice failed to creak into action on the heels of Lanata’s investigation. Despite the fact that his televised reports provided compelling information linking a Puerto Madero finance firm called SGI—and nicknamed “La Rosadita” due to its geographic proximity and alleged connection with the Casa Rosada (Government House)—and its former owner, Federico Elaskar, to massive money laundering, the first part of the week passed without a single judge’s daring to invoke his/her own authority to order the premises searched. This, despite the fact that neighbors of Madero Center—the building where the company has its office, and where not only Vice President Amado Boudou but also President Kirchner reportedly own property—went onto Facebook and Twitter to report boxes apparently containing documentation being carried from the building. It wasn’t until Thursday, in the very midst of the A18 mass protests, that police descended on the finance firm’s offices, making a great show of the raid, despite the fact that if they’d found anything of relevance to the Lanata investigation, it would have been a miracle, since those implicated in corruption in high places, had been given all week to make sure anything incriminating—more incriminating, that is, than the documentation Lanata had already made public—was long gone. Báezes, father and son, Lázaro and Martín. Close ties. 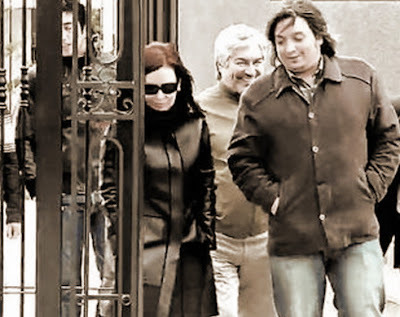 Perhaps one of the principal virtues of Lanata’s investigation is that it has taken corruption out of the realm of generality and put names and faces with events, as well as specifying the connections between political and economic powers in the Kirchner era. He has introduced us to Santa Cruz strongman Lázaro Báez, who over two decades and on the strength of his relationship with former governor and president Néstor Kirchner—as attested even by Kirchner’s former lieutenant governor, Eduardo Arnold—went from being an obscure provincial bank teller to, first, running the bank, and then, acquiring a bankrupt construction company and turning it into a major State contractor, as well as accruing interests in oil, media, aeronautics and land (some 250,000 hectares, most of which he bought with cash). Leonardo Fariña, a compulsive talker. We also met the flamboyant and singularly indiscreet Leonardo Fariña, who distributed vast amounts of cash that the alleged Báez-Kirchner partnership flew out of Santa Cruz in amounts weighty enough to be considered air cargo. We met Federico Elaskar, who admitted to helping Fariña set up as many as 50 offshore phantom companies through which to launder vast sums of money, before being forced out of business by another nefarious face in the chain, that of Daniel Pérez Gadín. And we also met Fabián Rossi, whose business contacts, allegedly gained through his relationship with Argentine Ambassador Jorge Arguindegui in Panama, allowed him to help Báez set up ghost operations in foreign tax havens. As Lanata was revealing how in a country where foreign exchange regulations are so tight that Argentine tourists aren’t permitted to legally change enough pesos into dollars or euros to take a business trip or brief vacation abroad, friends of the ruling family have been moving foreign currency out of the country by the bale, another story was being told: that of Santa Cruz Province under the 12-year governorship of Néstor Kirchner. A province so remote and sparsely populated that for the vast majority of Argentines it might as well be another country, it would have been a good case study to have analyzed before the election of Kirchner to the presidency in 2003, when he was an unknown politician who just happened to be in the right place at the right time. Had observers seen how the Kirchners had their own province sewn up so tight that nothing happened without their say so, it would have been easy to see what was in store for the nation under their power structure model. In fact, many of the key players who have accompanied them in Santa Cruz have remained with them throughout their decade at the head of the national administration. And the President’s latest moves to tie the hands of the Judiciary are simply part of the Santa Cruz model of total control. With 125 seats in the Lower House of Congress belonging to ever faithful rubber-stamp Kirchnerist deputies, the effort to keep this affront to democratic rule from passing has boiled down to bringing as much opposition pressure as possible to bear on just 12 deputies whose past performance has marked them as swing voters. The “reform” bills would give the Executive virtual control over the naming and removal of judges, and, among other things, would also make it virtually immune to any legal recourse that citizens could take against it to protect their rights. 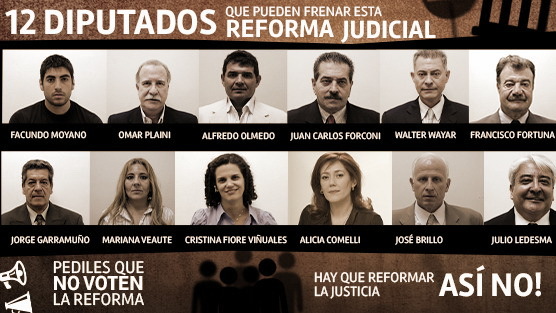 Until now the Kirchner government has had to find ad hoc ways of shoving a stick into the wheels of justice, such as allegedly naming temporary judges and prosecutors to replace ones it fears might rule against it. If its bills pass into law, it would be able to handle such manipulation of the Judiciary pretty much as it pleases and within a “legal”—if morally illegitimate—framework. The 12 mavericks on whom an independent Judiciary depends. A little over a year ago, on February 27, 2012, at a rally in Rosario commemorating the two hundredth anniversary of the first raising of the Argentine flag, Cristina Kirchner stated, in a nutshell, the essence of her government’s plan: “Vamos por todo...¡por todo!” (“We’re going for it all...for all of it!”) she shouted, gesticulating to a clump of her FPV (Frente para la Victoria) political movement gathered in the crowd before the reviewing stand in Argentina’s third largest city. It wasn’t part of her own speech. It was, instead, a sort of battle cry that she issued, without a microphone, in the middle of Socialist Mayor Mónica Fein’s speech, obviously startling the mayor, as the president’s fans drowned Fein out with their shouts of approval for their jefa’s words and gestures. It was a show of power and disrespect. It was Cristina trying to demonstrate to the mayor that she, not Fein, owned the street, that even if Fein was at the mike, the crowd belonged to the Kirchner regime and so did the country—but in ways that clearly have had little to do with democracy or constitutional administration. As political news commentator Joaquín Morales Solá pointed out this past week, Jorge Lanata’s investigation has brought to the fore what everybody in politics and serious journalism already knew: basically, that Argentina currently reeks of corruption as it never has before—which, after the era of Carlos Menem in the nineties, is saying a mouthful—and that the deeper meaning of “going for it all” carries with it a barely veiled and underlying threat and project of perpetuity in government, the creation of a popular dictatorship capable of protecting the burgeoning Kirchner estate and its friends and partners in power. 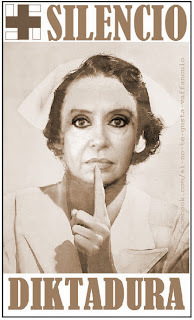 As Morales Solá tangentially points out, Lanata’s investigation has been a mere catalyst, a wake-up call, a way of whacking people—including a somnolent opposition—over the head with what, in voluntary blindness, they’ve been tripping over on a daily basis for the past ten years. If most people living in Argentina were honest with themselves, they would have to admit that they have long since seen the signs of advancing tyranny and crippling corruption within the power structures that are seeking to control every aspect of life in this country. But why did it take the unique head-on style of a Jorge Lanata to wake people from their lethargy even as their democracy, their freedom and their well-being are being wrested from their hands? The late Argentine physician and world-renowned heart specialist René Favaloro once said, “After so often seeing incompetence triumph and dishonor prosper, after so often seeing injustice grow, after so often seeing power in the hands of bad people burgeon, Man eventually becomes disheartened with virtue, laughs at honor, and is embarrassed to be honest.” Perhaps the answer to my question lies within this wise man’s simple yet crystal-clear observation. Some people still cling to the idea that Néstor and Cristina Kirchner’s original plan of passing the presidency back and forth between them ad infinitum died along with the late former president, and they cling as well to the hope that the presidential elections of 2015 will no longer contain a Kirchner as a candidate, since it is—currently at least—unconstitutional for any president to serve three consecutive terms. But astute and highly respected political analyst Nelson Castro said it all when he reminded the country this past week that for Cristina Kirchner and her entourage, “a ‘re-reelection’ is a matter of life and death.” Clearly, without a means of retaining their hold on power and the judicial immunity that goes with it, the President and her entourage would become common (if vastly wealthy) citizens, who could be called upon to answer for all charges and allegations against them. The latest advances by the President and her rubber stamp majority in the Senate against the necessary checks and balances of any truly democratic society should have left no doubt in anyone’s mind about their intention to “go for all of it” by also controlling the Judiciary and thus sealing their future impunity. And if they manage to get away with it by also carrying the Lower House of Congress, then there should also be no doubt about what their next move will be: a rubber stamp constitutional “reform” aimed at “legalizing” the President’s illegitimate, totalitarian ambitions and perpetuating her administration in power. Clear, precise and, above all, the naked truth. I have nothing to add, except to pray that our future will not be the dark one, especially when I think of my daughter and 2 grandboys. Thanks, as always, Sylvia, for your ever enlightened comments. I think your story of Mr. Herrera is a clear example of how little the country knew of the Kirchners back in 2003. That was, of course, the whole idea of President Eduardo Duhalde's having backed Néstor Kirchner in the first place. After the economic meltdown and virtual civilian coup of 2001 and the musical-chairs presidencies that followed for the next couple of years, the Peronists needed a candidate with a fresh face that no one knew. This is where one might apply the old adage, "Better the devil you know than the devil you don't." I truly believe that people voted massively for Kirchner because they had no idea who he was and the ones they did know, they were tired of seeing. And they largely voted for Cristina K. on the strength of the Kirchners' repeal of the Full Stop and Due Obedience laws. This was something the K government could do without any grave consequences since, by that time, the Armed Forces had not only been democratized, but had also been largely dismantled, so there was no longer any danger of a coup. While that single act might be seen as a great humanitarian and legal achievement on the part of their government (indeed, making human rights violators pay for their crimes is the only way to ensure that it doesn't happen again)the Kirchners have cleverly and shamelessly used their human rights record to cover up a multitude of sins of their own. That's right, nobody knew NK back then. But, unless my memory fails me, didn't he win by barely 24% because Carlos Menem backed out of the ballotage? Didn't he just get in by the backdoor, like a virus in a computer? Clear me up on this one, Dan. I'm feeling very low today due to what's going on in Congress. Wouldn't it be wonderful to wake up to the news that we're still living in a Republic? Thanks again, Sylvia. You're referring, of course, to the dubious rush passage of the controversial judicial "reform", and the scandal it caused in Congress--including vociferous arguments, pushes, shoves and punches thrown, before the opposition walked out, following the blatant last-minute switch pulled by Deputy Alicia Comelli to give the gov't the winning vote it needed. Yes, it's a sad day for what was left of Argentine democracy. With regard to Néstor Kirchner, yes, he won by the skin of his teeth due to the fact that he and Menem were only a point or so away from each other and Menem chickened out because he didn't think he could win in second-round voting. I suspect that Menem's fear was that he might lose and temporarily be without political immunity to prosecution for the flagrant corruption with which his administration was being charged (but which now looks like child's play by comparison). I figure he decided it was safer to hang onto his senator's seat than to go for broke and maybe end up in jail. But Néstor's having repealed the Full Stop and Due Obedience laws and permitting repressors other than the Junta members of the military regime to be tried for their crimes cinched the first and second wins for his wife as President, together with a completely coincidental favorable climate for emerging economies (an opportunity that Cristina Kirchner has since managed to trash by grid-locking the foreign exchange system, closing the country to imports, aligning her foreign policy with some of the world's worst dictatorships, and undermining legal security in Argentina). Anon, I don't really see the connection. All presidents get upset with the press at one time or another. It's the nature of the relationship. The job of the Fourth Estate is to keep its eye on the other three. I'm no defender of Clarín and/or La Nación--as I've clearly stated here before--since as the country's largest selling newspapers, their role during the former military dictatorship was cowardly and shameful and contrary to every tenet of the duties of journalism. But neither am I an enemy on principle of the many highly respected journalists and investigators who are working for them today, since whatever the ulterior motives of these media might be,they have strayed beyond their usual confort zone and permitted themselves to become strange bedfellows with newsmen who are doing a proper and thorough job of investigating corruption and deceipt in high places. While Alfonsín may have been critical of the press whenever it wrote against him, it is imposible to compare his actions with those of Cristina Kirchner, who has founded a major part of her domestic policy on running Clarín (with which she and her late husband were originally as thick as thieves) out of business and shutting the rest of the opposition press up by any and all means at her disposal, while seeking to control the rest by means of her big-business surrogates, as well as by turning supposedly autonomous state media into blatant government mouthpieces of which she abusively makes use. Briefly stated, despite any shortcomings he may have had, Alfonsín was, above all, an unquestionable democrat, while Cristina Kirchner is becoming an ever more flagrant caricature of a typically autocratic village tyrant. A great entry, as always. Thank you very much Dan for your precise and thoroughly documented comments. Once again, thank you very much for your blog! Thank YOU, Javier, for reading it and sharing your comments with me. I'm afraid I do indeed believe my last statement to be a reality. Kirchner surrogates have again and again made it abundantly clear that for them, the 54% majority that elected Cristina the last time should be considered a verdict for life, and that, like the Pope, she has been chosen to head the Argentina government ad infinitum. In the best of all posible worlds, you're right, there should be no way that this could be posible. And, yes, in such a world it would almost surely be imposible for her to get a two-thirds majority. But the Kirchner Argentina is clearly not the best of all posible worlds, as the scandalous congressional vote that we've just seen bears witness. With a rubber-stamp headstart of 125 votes, other wills seem easy enough to bend. Deputy Alicia Comelli was a clear example (but not the only one, surely, just the most blatant). She originally spoke against the judicial "reform", then abstained from voting, and then, at the last second claimed an electronic error had failed to take her yes vote. I wish I could have been in Congress and invisible for a moment during the voting in order to overhear what transpired in the gap between that dubious abstention and her miraculously accepted yes vote that came after the official count. This "reform" was a rush job. But with time to "work their magic", I doubt the Kirchner regime will have any problem conjuring up a majority when the time comes. Unless, that is, anti-K popular pressure continues to burgeon and turns the decisions of any rubber stamp Congress into a moot point. Either way, the outlook is grim. Dead on target, as usual! Thank you Dan! I do believe however that nobody can argue they were unaware of the Kirchners intentions in 2003. I beg to disagree with Silvia. You did not have reside in Rio Gallegos to know what they were about. I also recall the political campaigns of Recrear (2007) and Coalición Cívica (2011), which documented government corruption at national and provincial levels. The sad truth is that people were quite willing to ignore corruption, as long as it spared their pockets. Corruption only becomes an issue with us, when the economy fails us. When will we ever learn? Thank you once again, Rab, for your kind comments. Someone in the know like yourself surely knew more than the rest of Argentine mortals about who the K Klan were, but I know, living in Patagonia at the time, that ignorance about the Kirchners and the village tyranny that they operated in Río Gallegos was widespread. 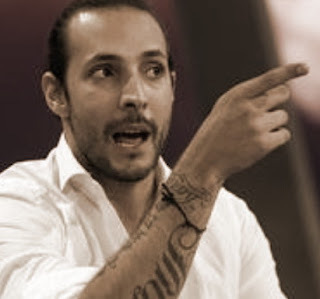 Few people indeed knew who Néstor was, and fewer still, Cristina. Duhalde did, I presume, but never thought they'd have the gall to betray him. Argentina, through much of the twentieth century remained the most powerful economy in South America. But with its long since having far and away given that position up to Brazil and now having fallen behind Colombia and Chile as well, and with an 80% gap between the parallel and oficial dollars, perhaps that rude awakening you mention won't be long in coming. Before the 2003 election, chatting with fellow coworkers who seemed hopeful about the K candidacy, I had the opportunity to summarize his achievements as a Governor. I asked them what persuaded them that he would do otherwise as President. They were adamant. Finally one of them said: "You don't understand, we need to believe in someone" That is when it finally dawned on me that we are doomed.